Last month we began to look at our verse for 2015. We saw that what makes us true followers of Jesus Christ is that we know Jesus. Christians are fundamentally “God-knowers” who walk in personal relationship with God through Jesus Christ. This month I would like to focus on what this passage teaches us not only about knowing Jesus but about treasuring Him. If we truly do know Jesus then we know that we have a treasure of surpassing worth. 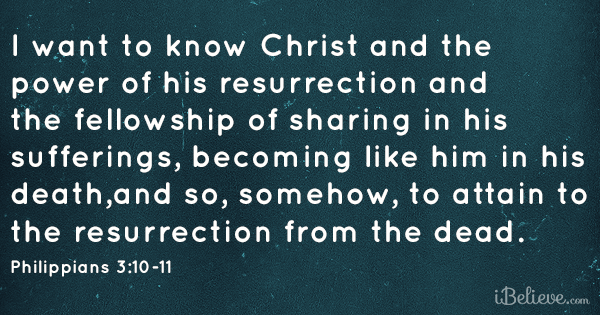 What does it mean that we consider all things “loss” compared to knowing Jesus? It means that we would rather have Jesus than everything the world holds as valuable. As Tullian Tchividjian so eloquently put it: Jesus + Nothing = Everything. Christians should be able to live in joyful contentment throughout every circumstance. If we have nothing in this world we still have everything one could ever want and need. We are joyful even when we are without money, without health, without comfort, without family, without appreciation, without shelter, without food and water, without security. No matter whatever else we lose, we have Jesus. We can count all of our hardships in this life as “light and momentary troubles” compared to the “weighty and lasting glory” of knowing Jesus. We can say that the inverse is also true: Everything – Jesus = Nothing. In fact, remove Jesus from our lives and they become not simply nothing, but less than nothing: we run at an infinite loss. Therefore knowing and treasuring Jesus is not only our source of joy in a world of hardship, it is also our source of contentment in a world of greed. I doubt there has ever been such an impulsive, consumerist society as ours. We are one click away from buying all kinds of things on Amazon or Ebay that we think will make us happier, more fulfilled people. Yet Christians should be able to rise above the fray of retail therapy and walk through this life utterly content. We should be utterly content because our soul’s are satisfied by their union with Jesus. “Riches I need not; nor man’s empty praise. Dear friends, let us strive to make Jesus the supreme treasure of our lives. Anything less is not worthy of Him.